In RETNS we recognise the value of physical exercise for children and as a school we strive to promote physical education and to be an active school community. All of our teachers adhere to DES guidelines regarding PE timetable provision for all students and teach a broad and balanced PE curriculum. Each year we endeavour to develop sport in different ways, both in school and through our extra-curricular programme. We had lots of pupils taking part in Santry this year. See blog on main page. In RETNS we recognise the value of physical exercise for children and as a school we strive to promote physical education and to be an active school community. All of our teachers adhere to DES guidelines regarding PE timetable provision for all students and teach a broad and balanced PE curriculum. Each year we endeavour to develop sport in different ways, both in school and through our extra-curricular programme. This year we will continue with basketball in the school and we have both a boys’ and girls’ team competing in the schools’ mini-basketball league. This year also they will be proudly sporting their new RETNS strips! Basketball is also being offered as an extra-curricular activity. Over the past few years we put a special focus on developing athletics in the school. Athletics is a particularly good area of sport in which to develop individual abilities and where each child can be provided with opportunities to challenge him/herself to run faster for longer periods, to throw an implement further and to jump further or higher. Athletics is particularly suitable for children of different abilities as it allows the satisfaction of individual improvement, while providing an opportunity for children who are not interested in team sports to take part in a fun and personally challenging physical activity. Athletics is being offered as an extra-curricular activity for the first time this year. Athletics coaching for those entering for Santry Sports will begin later in the year. To mark the start of our #BeActive initiative, we had a very competitive staff/ student game of Olympic Handball. There was a great atmosphere and a lot of sportsmanship from both the winners and losers! Have a look at some comments and a video of the game by Dennison Leadbetter (6th class) on our website and on the kids’ blog. In addition to our regular PE classes for all pupils, throughout the year we will promote physical activity as a key to well-being and will avail of lots of opportunities to introduce the children to different forms of physical activity, as well as celebrating the efforts of our school teams. To get us off to a good start, our fifth and sixth classes will be taking part in a Sport for Living event in Santry in early October, delivered by Youth Sport Trust. The day will incorporate a number of different sporting and team building activities and will create opportunities for children to try out new and varied sports and to have fun together. Our GAA coaching will continue this year with Carol from Ballinteer St. John’s. Carol provides coaching for children in first and second class in GAA games. This year we also hope to avail of a new initiative by the GAA to provide additional coaching to local primary schools by specially trained transition year students, culminating in an inter-schools blitz in the Spring term. RETNS has senior girls’ and boys’ soccer teams that compete in the FAI Schools league at both 5-a-side and 11-a-side levels. We also have an FAI qualified coach who has been coaching different class levels in our school plus we have a local link with Leicester Celtic FC and we play some of our matches on their all-weather facilities. RETNS competes in schools athletics competitions at U10, U11, U12 and U13 at Morton Stadium in Santry. 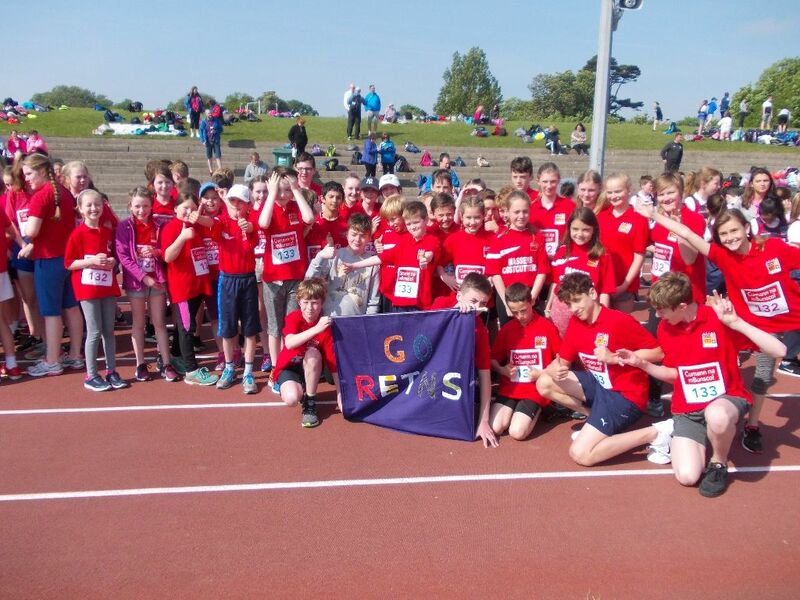 32 children competed in Schools Athletics in Santry last year and a great day was had by all involved. Athletics competitions take place in June. Selection and training happens in April and May. RETNS has a strong link with Ballinteer St. John’s GAA club and their Coaching Development officer Nora has been coaching all levels from senior infants to 6th class over the past few years. Many children in the school know Nora well from being a member of Ballinteer St. John’s. Children are learning the fundamental skills of Gaelic football and hurling. We were also lucky to have a visit from some of the All-Ireland winning Dublin team. They came to the school with the Sam McGuire Cup. A big thank you to Nora for organising this. Children from 1st to 6th class attend swimming lessons at the Dun Laoghaire Rathdown County Council swimming pool at Meadowbrook. All children learn valuable life skills and improve their existing swimming skills. Children from 5th and 6th class take part in cycling and road safety awareness lessons. Each week bikes are brought to the school or they use their own bikes to develop their cycling skills and increase their awareness of the importance of road and cycle safety. We are delighted to welcome the return of Catherine to the school for dance classes. dance classes take place in the second term, during school, with all classes and the children really enjoy Catherine’s creative and energetic dance routines and activities. RETNS got talent! 5th and 6th class pupils have participated in Dun Laoghaire Rathdown County Council’s Something Fishy programme. There is a huge demand for this programme and we were very lucky to secure a place. Ronan and Anne attended a day course explaining the workings of the programme along the Dodder River. An initiative between the Central Fisheries board and the County Council, organisational representatives come to the classroom to teach the children all about the importance of water conservation and promoting the development of river side flora and fauna. Coaches from Leinster rugby are doing tag rugby coaching with 5th and 6th class . This is a great opportunity for boys and girls to develop fundamental tag catching and throwing skills with the help of professional coaches. In the school year 2013-2014 we introduced tennis into the school. All classes participated in tennis coaching, learning skills from basic ball skills to competitive game skills. We hope this will be an annual addition to our sports programme. RETNS has an extensive after school programme with a range of activities from hockey, dodgeball, playball, soccer, tennis, volleyball, chess, and more. In the third term every year we have our sponsored walk and our sports day, while at intervals throughout the year we promote fitness through Skip-hop and active school days.